Glastonbury 2017 Day One: Arrival, Pitching, Fireworks, Sleeping | Cinema, etc. I’ve arrived at Glastonbury for another year of fun in the sun. The weather is absolutely scorching and the beers I’ve brought with me are still, just about, cold. Much of my anticipation of the festival has been around two of the headliners: The Foo Fighters and Radiohead. I’m a huge fan of both, with the two of them being in heavy rotation when I was doing my GCSEs and A Levels. It sounds corny to reply with two of the headliners when asked about who I’m most excited about, but it’s an honest answer. They’ve simply been there for me for two decades. Wednesday is usually about exploring and getting used to the site. A few things feel like they’ve moved around but to be honest I’m not 100% confident on what is where anymore. 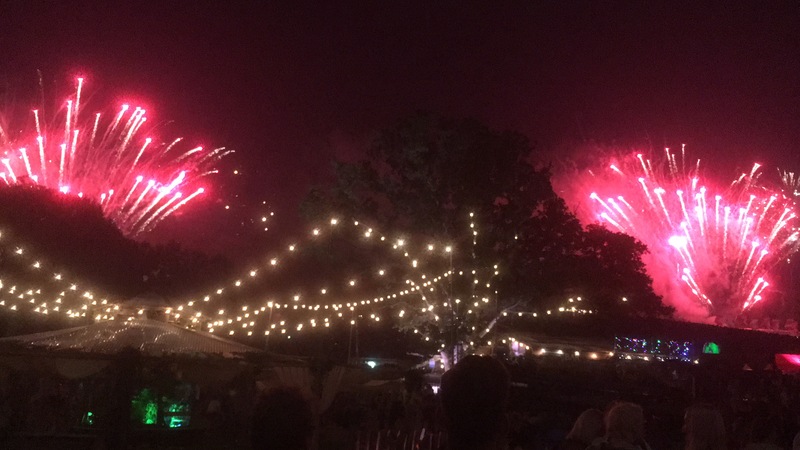 The highlight for me was catching a gigantic fireworks display up in the Stone Circle near The Park. It was extensive and the crowd appreciated it. My only draw back was observing that one of the displays was exceptionally close to my camp site and seemed to be the most unwieldy. Fortunately my tent was still there when I got back! For many, watching the summer soltace sunset at Glastonbury is a rite of passage. For me, I remember people cheering. Unfortunately, I was asleep at the time. Evidently the three-mile walk from car to campsite had taken it out of me. A perfect start to the festival, though hopefully I’ll last longer tomorrow!